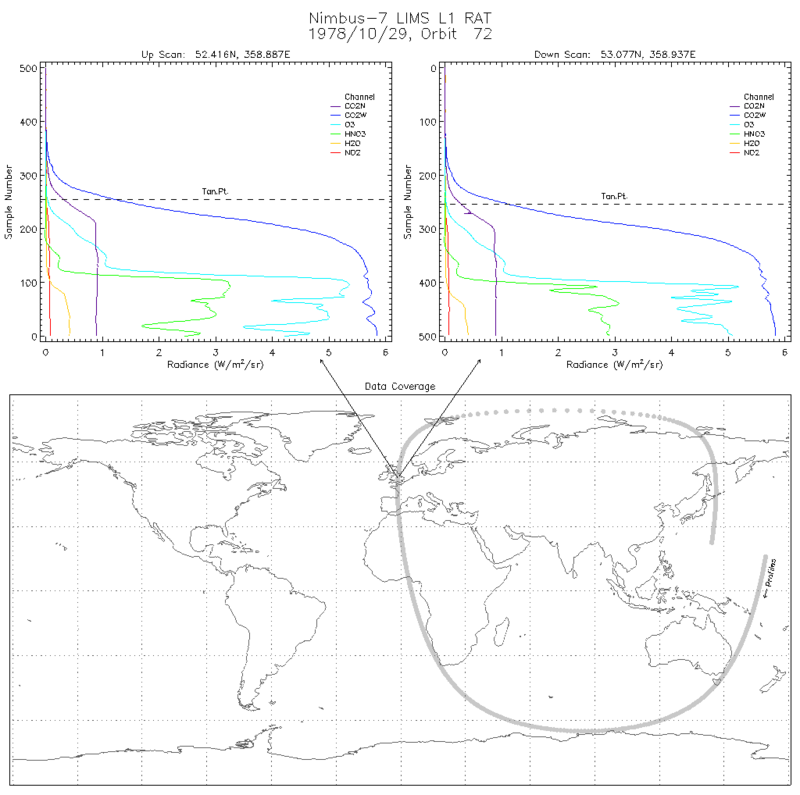 LIMSN7L1RAT is the Nimbus-7 Limb Infrared Monitor of the Stratosphere (LIMS) Level-1 Radiance Data product. It contains calibrated, earth-located radiances, as well as housekeeping information, instrument status, and data quality information. Radiances of the Earth limb were measured both day and night in six spectral bands (6.2, 6.3, 9.6, 11.3, and two at 15 micrometers). Though calibrated, the radiances are not corrected for instrument effects such as field-of-view, electronic delay, and spacecraft motion. Each file contains one orbit of data (~14 orbits per day). LIMS is a limb profiler and spatial coverage is near global between latitude -64 and +84 degrees. Vertical coverage is from about 10 to 50 km (O3 channel to 65 km), with vertical resolution of about 1.5 km. The data are available from 25 October 1978 through 30 May 1979. The principal investigators for the LIMS experiment were Dr. James M. Russell, III from NASA Langley and Dr. John Gille from NCAR. This product was previously available from the NASA National Space Science Data Center (NSSDC) under the name LIMS Radiance Archival Data with the identifier ESAC-00032 (old id 78-098A-01B). Typical data coverage of a Nimbus 7 LIMS RAT data file.